The press wonders why HHS suddenly gave out unscrubbed interim numbers. A White House reporter is asking why the U.S. Department of Health and Human Services gave out interim exchange activity numbers last week. Since the Patient Protection and Affordable Care Act exchange open enrollment period started Oct. 1, HHS officials have repeatedly refused to give reporters or others detailed interim exchange application or enrollment data. HHS officials have insisted that the department will give activity numbers once a month, and only once a month, after they have checked data from the HHS-run and state-based exchanges for completeness and accuracy. HHS Secretary Kathleen Sebelius then announced last week, at a speech in Florida, that the exchange system had received private-plan selection information for 3 million people as of mid-January. 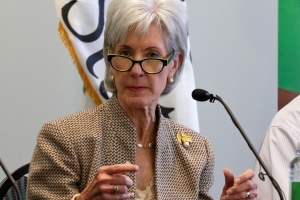 A reporter asked at a White House press briefing why Sebelius had released “good news data” several weeks before the release data of the next monthly exchange activity report. White House Press Secretary Jay Carney referred questions about the data to HHS.